The name "Grimoire" is derived from the word "Grammar". A grammar is a description of a set of symbols and how to combine them to create well-formed sentences. A Grimoire is, appropriately enough, a description of a set of magickal symbols and how to combine them properly. Most of the texts linked below are descriptions of traditional European ritual magick, which is based on Judeo-Christianity. Even though this must not be confused with neo-Paganism, many of the neo-Pagan traditions use similar rituals and techniques, albeit with a different (usually Celtic) vocabulary. Note: These historical texts are presented for research and entertainment purposes only; we can't answer any questions about the material contained in them. Please refer to the sacred-texts FAQ before sending any email about these texts. The Book of the Sacred Magic of Abramelin the Mage Translated by S.L. MacGregor Mathers . This grimoire is a primary source for modern ceremonial magic. The Magus By Francis Barrett . One of the rarest and most reputable treatments of ceremonial magic. Discusses topics such as alchemy, astrology, and the Kabbalah. By Arthur Edward Waite . Comprehensive descriptions of rituals from classic grimoires, including extensive illustrations of magical seals. Grimoires covered include the Greater and Lesser Keys of Solomon, the Grimorium Verum, and the Black Pullet. Also known as the Book of Black Magic . Two very mysterious grimoires. These two grimoires (originating from the same book) are often cited as being used by Vodun/Obeah practitioners. Although they claim to be Kabbalistic in nature, there is very little if any actual Kabbalah to be found in them. Rather this appears to be a traditional ritual magick system with incantations to summon and dismiss spirits to achieve worldly ends. Published in 1849, and translated into English in 1880, the 6th and 7th Books of Moses claim to include material from 1338, 1383 and 1501, including portions reputedly translated from the "Cuthan-Samaritan" language, which has been extinct since the 12th Century A.D., and about which very little is known. 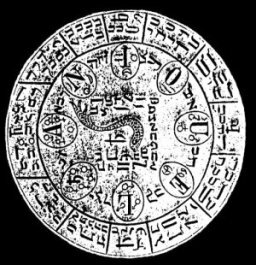 The most interesting aspects of this book are the unique illustrations of magickal seals, with letters in Hebrew and an unknown script; and the lists of names of demonic entities. Note: the images in this grimoire were originally printed in the 19th Century using very primitive printing technology. To prepare them for publication on the Internet, they were scanned from the best source available and then image-processed to bring out details. Unfortunately some of these plates have illegible portions. Note: the first five books of Moses are the traditionally the first five books of the Bible. The Key of Solomon The King. The key to modern ceremonial magic. Although the author of this grimoire was traditionally the biblical King Solomon, it was probably written in the 13th Century A.D. It was translated by S. Liddell MacGregor Mathers in 1888; Mathers subsequently had a lot of influence in the Golden Dawn movement, one of the sources of modern ritual magic; it is said that he co-wrote its rituals with W.B. Yeats. 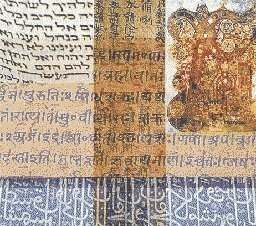 Mathers also translated the Kabbalah. The Lesser Key of Solomon by S.L. MacGregor Mathers and Aleister Crowley . The companion Grimoire to the Greater Key of Solomon, (for which, see above). It focuses on the characteristics of the various demons, and the summoning rituals. Pow-wows; or Long Lost Friend by George Hohman . A grimoire in the "Pow-wow" tradition of the Pennsylvania Dutch. In spite of the name, Pow-wow is not a Native American tradition, but a rural European healing and hexing system which was imported into America in the 18th and 19th Century by German immigrants. After nearly dying out it has experienced a small revival in recent years.